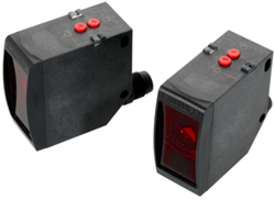 Balluff's New Time of Flight Distance Sensors increase detection range. Balluff's 23K line of products includes the BOD 23K distance sensor. The sensor utilizes time of flight technology that increases the range of object detection up to 30 meters. Sensors are available for both class 1 and class 2 light source sensing in background suppression, diffuse, polarized retroflective, and through-beam varieties. The sensor housing is IP69K rated and Ecolab certified for food and beverage applications. For factory automation applications from packaging to automotive assembly, Balluff's newest distance sensor utilizes time of flight technology allowing for detection of objects at longer distances even with challenging surface characteristics. The BOD 23K sensor has easy integration and configuration by incorporating flexible outputs and pushbutton setup. Following the entire 23K portfolio this sensor housing is IP69K rated and Ecolab certified for food and beverage applications. For automotive assembly applications the 5 meter range, less than 5mm resolution and class 1 laser provide for exceptional positioning and error-proofing applications. "Configurable teach points combined with a scalable voltage/current analog output allow for flexible manufacturing applications to be achieved," shares Jack Moermond, Product Marketing Manager for photoelectric sensors.